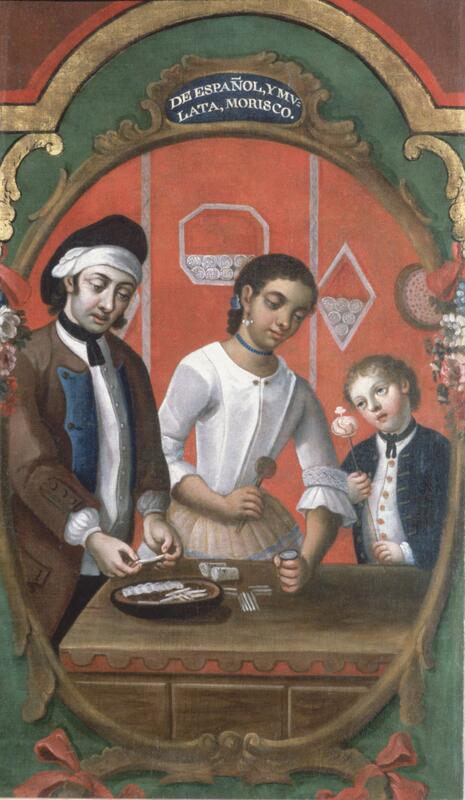 This painting, known as a casta painting, highlights the ethnic mixing of peoples in Spanish America. The genre was created in both the viceroyalties of Perú and New Spain, although more seem to have been made in Mexico City than elsewhere. This particular example is typical of the genre in showing a mixed-race couple and their offspring. Here, a man and woman (father and husband, mother and wife) roll cigarettes in a small shop while their child plays. The label on this painting reads, “De Español, y Mulata, Morisco,” (from Spaniard and mulatta, a morisco). The woman’s slightly darkened skin color is meant to identify her as amulatta, a person of Spanish and African heritage. The child’s pale skin and rosy cheeks suggest his parents’ union leads towards “whitening” rather than “darkening,” a desired outcome in New Spain at the time. The family is busy making cigarettes, the finished bundles lining the niches on the back wall. 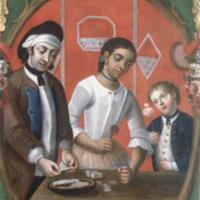 The painting suggests that cigarette production in the 18th-century was a small cottage industry. But most cigarettes made for urban consumers were produced in large government-run factories by the working poor. The edges of the painting have been cropped, and it may have once been part of a larger work or part of a whole series. Its unusual vertical format suggests it may have formed a panel of a largerbiombo, or folding screen. The painter’s name is no longer known. In Mexico City, however, painters of both great and lesser renown fulfilled commissions for casta paintings. Viceroys, church fathers and other well-heeled colonial officials often commissioned casta paintings, although the patron of this painting is not known. The painting was probably one of a series (typically 14-16 panels created a set), although its companions are not known. It is an oil painting on canvas, and measures 41 1/2 x 25 inches (105.6 x 63.5 cm). Originally, this painting would have been owned by an individual and perhaps displayed in a private house. Many casta paintings seem to have been commissioned for export to Spain—either as gifts or for personal collections. Today this painting forms part of the collection of the Denver Art Museum in the United States. This painting exemplifies a genre of image-making invented in Spanish America to document, describe and comment upon ethnic mixing. While no city in Spain would have been ethnically homogenous, the mixing of peoples in American cities was far more diverse and complex. For urban Creole and Spanish residents who commissioned paintings such as this one, the mixing of peoples was at once a curiosity, a source of social and economic anxiety, and fact of daily life. Carrera, Magali. 2003. Imagining Identity in New Spain: Race, Lineage and the Colonial Body in Portraiture and Casta Paintings. Austin. University of Texas Press. Deans-Smith, Susan. 1992. Bureaucrats, Planters and Workers: The Making of the Tobacco Monopoly in Bourbon Mexico. Austin, Texas: University of Texas Press. Earle, Rebecca. 2016. "The Pleasures of Taxonomy: Casta Paintings, Classification and Colonialism." William and Mary Quarterly 73 (3): 427-466. García Sáiz, Concepción. 1989. Las castas mexicanas: Un género pictórico americano. Milan: Olivetti. Katzew, Ilona and Susan Deans-Smith, eds., 2009. Race and Classification: the Case of Mexican America. Stanford: Stanford University Press.